2017 was the third time I ran 3M. It was the second time I ran it just for fun as part of my training for Austin. I’ve only raced in once, and it’s where I got my PR. This year I incorporated it into my final 20-miler. 2017 was without doubt the most fun I’ve had! I ran with three of my favorite friends from the Gazelles. We didn’t warm up, started in the back, and stopped for bathroom and water breaks. These are things I never do at a race! Even though I wasn’t racing, I did use my Clif shots along the way (mocha is my favorite). Because we went at an easy pace, I was able to appreciate the spectators and great support out there on the course. My favorite part was the turn at Bob Bullock museum when my coach, Gilbert Tuhabonye, cheered us on. Seconds later, my husband and boys were ringing their cowbells! After the race, we went for brunch with a group of Gazelles and their families, which completed a perfect Sunday! Training overall is going great. Yesterday I did my last hard long run, which included 10 miles at MGP. The conditions were great, so I can only hope that will also be the case on marathon day. Nutrition can be a challenge for me as I work as a clinical psychologist, have two kids, and eat vegan 90 percent of the time (I sneak pizza in occasionally!). I also insist on eating organic and only feeding my children organic food. Unfortunately, many convenient foods that are also kid friendly are not organic. This is why Clif Bar products are a staple in our house. The Coconut Almond Butter Nut Butter Filled bars are my favorite and I eat them after workouts and at work if I need a snack. My kids are huge fans of the kids protein bars and of course the z bars are always a favorite. The Gazelle training has a couple hard workouts left, I know I will be fueled up and ready to give my all! Training has been going well so far! I have had a recent tendon strain, but with careful planning I have been able to keep up with my training schedule. Running the 3M Half Marathon provided a great perspective on how I need to plan for race day for the Austin Marathon. I used the Clif Strawberry Blok Chews around Mile 9 and they gave me that extra push to finish the race. I have been alternating between using the chews and the gels during my training runs and I feel both give me the energy I need to finish the workout. I like both, so my 20 mile run this weekend will determine which one I use for Austin. I felt I ran a great race and I plan on running the 3M Half again next year with a PR goal! I have also been eating the Peanut Butter Clif Bars (the chocolate peanut butter are my favorite!) before my weekly runs and they have helped in boosting my pre-run snack with the energy I need to get through my workout. My weekday runs are always in the evening since I work very early in the morning and after a long day of work, they really help! An update on our special series featuring four Austin runners and their journey as they train for the upcoming 3M Half Marathon and the Austin Marathon. Brought to you by CLIF Bar & Company, the Official Sports Nutrition of the 2017 Austin Marathon presented by NXP. Training has been difficult (with graduate school, work, injury, and life), but that’s why I love to run. I love the challenges and even the set backs. They prove to me that I am a strong individual and can conquer anything with hard work and dedication. In September, I pulled my hamstring and had to really cut back on my running. In October/November, I was running about 20-30 miles weekly. During those weeks, I tried to focus on having one tempo, one medium run, and a long run. In December, I ramped up my mileage to 40 miles and ended up getting Achilles Tendinitis. Since then, I have had to focus on cycling to help maintain my endurance and have started to incorporate weight lifting in the hopes that it will help to prevent any further injury. 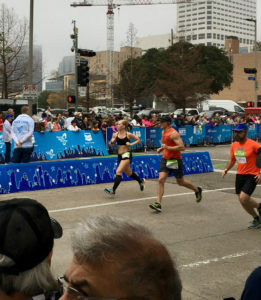 I ran Run for the Water (1:19), Decker Challenge (1:43) and the Houston Half (1:49— gosh I lost my speed) and used those to gauge my capabilities. I’m hoping to run at least a 1:40 at 3M, but will adjust my goal and pace during the race as needed. This type of adjustment during my races has helped to keep me positive, helps to further drive my passion for racing, and and has been key to not allowing myself to give in to negative thinking. Nut Butter Filled CLIF Bars. CLIF has helped to fuel me during all forms of exercise. I love the CLIF Shot Energy Gel and use that 30 minutes prior to my activity. The Mocha is my favorite and I love the extra boost of energy that the caffeine gives me! I then follow up at 30 minutes with the CLIF Bloks and continue those based on the length of my run/activity. The Strawberry is my favorite! I’ve have also fallen in love with the scrumptious Nut Butter Filled bars and snack on them often. The CLIF bars are great when I need a snack at school. They help keep me full and provide me with a healthy organic snack option.